Note from Davonne: I’ve been amazed at how quickly this Get-Organized challenge has taken off! I’ve received so many e-mails and requests for help that I decided to bring in a few experts to help me answer some of them. Today’s expert is Bonnie from Our Second-Hand House, and she’s a pro at organizing storage areas! Linda, you seem to have a lot of space in your basement and it looks like it is somewhat organized under some of the layers. Clutter can add up fast, especially if you are taking in items for other people. If you don’t have a use for items that have been left to you, you can ask other family members if they want the items before getting rid of them. If you are holding furniture, books, clothes, etc. for other people, give those people a deadline to get their things out of your basement. Once the deadline passes, have the items hauled away. While these items clutter your basement and are a problem for you, they are out of sight and out of mind to the rightful owner. But remember that you aren’t a storage facility and if someone else really wants the items, they’ll find a way to make room for those things in their own homes. Once you have taken care other people’s things, it’s time to tackle your own. It looks like you have a lot of shelf space and a lot of bins, cabinets and boxes you can use to organize your stuff. Having the right storage containers will be really helpful as you organize! Go through every single box, bin, drawer, etc. and put items into 3 piles, “keep,” “toss,” or “donate.” After you have made your three piles you should take care of the “toss” and “donate” piles first. Get those things out of the house as quickly as possible! Now you are ready to put the items you use, love, or need back into bins, drawers or boxes with other like items. For example, store all of your sewing/crafting/knitting type items together. Make sure every box, bin, or drawer is labeled. This will help you find stuff and know where to put it away when you’re done with it. Read about a very fast and easy labeling system here. You already have everything you need to achieve an organized shelving unit similar to this one from On The Outskirts of Town. Once your books are all on the shelves, use any left over shelf space to hold small bins containing some of your smaller items or paperwork. Davonne has some great tips for simplifying paper clutter. You can achieve a look similar to this bookshelf from Dollar Store House. Need a storage solution for your boards games? Try storing them vertically! You can store smaller suitcases inside of larger ones. If you don’t travel often, you can use your suitcases to store large bulky items such as blankets. If you store stuff in them, keep them on a bottom shelf. If they are empty you can attach hooks to the drywall or rafters to hang them out of the way. I understand the sentimental value of your kids clothes and toys and wanting to pass them along to grandchildren. Try to reduce the amount of these items to 1 bin per person. Make sure to label the bin with the name of the person it belongs to. Davonne has some fast and frugal storage solutions that I use in my own home. If you’d like to keep your long table, you could try using this table in the laundry area to have a large surface for folding clothes, or you could use it for a nice-sized craft table. It took 37 years for your basement to become cluttered. It’s going to take some time to cut the clutter and get it organized. Make a plan and set aside some time to work on it a little each week until it’s all done. 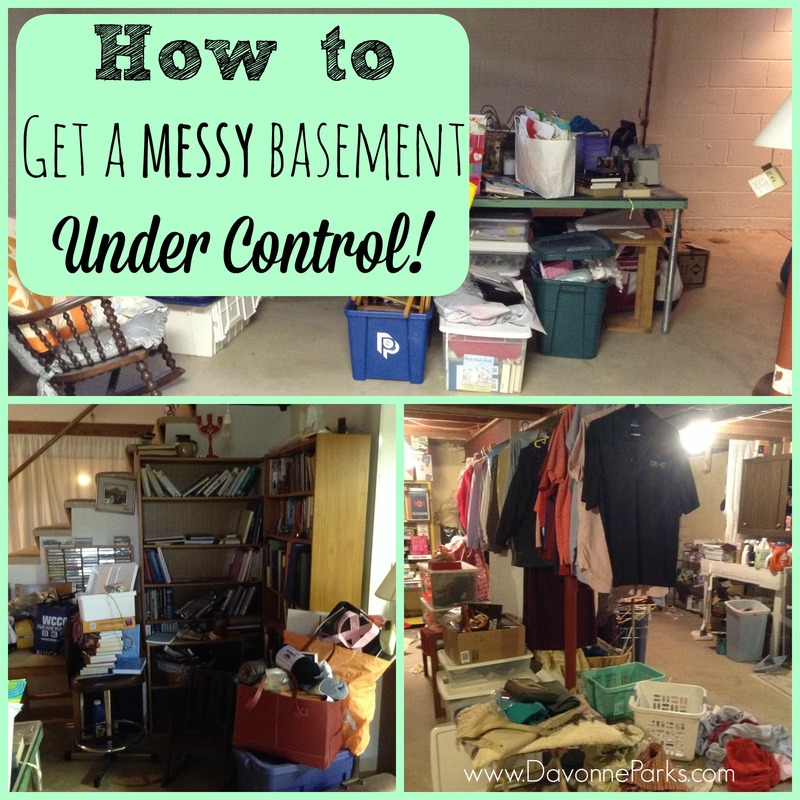 I hope these tips will help you tame the clutter and reclaim your basement! I’d love for you visit me on my blog, Our Secondhand House, for DIY decor, thrift store makeovers, and home improvement.